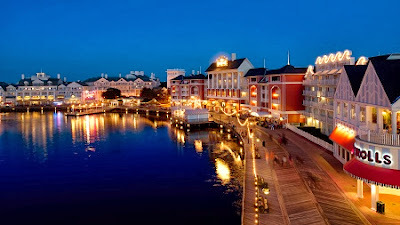 DISNEY'S BOARDWALK PROMENADE - A lovely nighttme entertainment option! 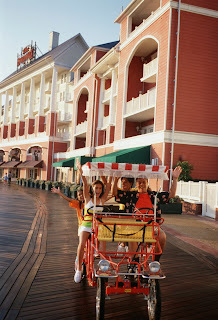 A little gem off the beaten path is Disney’s BoardWalk entertainment promenade. One of my top Disney happy places, it offers something for everyone making it a great place to visit whether you are traveling with young kids, teens or as a couple. Modeled after the turn of the century East Coast Shore destinations such as Atlantic City or Coney Island, this quarter mile boardwalk offers great restaurants, shops and entertainment. It is a short walk out of the International Gateway in Epcot’s World Showcase or a relaxing boat ride from Hollywood Studios. Since there is no direct Disney bus transportation offered between resorts, the quickest access is to take a bus to Disney’s Boardwalk Resort from a park or Downtown Disney. There are lots of great dining options along the BoardWalk with a wide variety of offerings including Kouzzina’s, celebrity iron chef Cat Cora’s Greek inspired restaurant; Flying Fish, a signature restaurant featuring upscale seafood dishes; and Big River Grille and Brew Works where you can sample beers, enjoy some tasty food and what I especially love, outdoor seating where there is a little more Disney and little less convention feel. The sports lovers in your group will not want to miss the ESPN Club for food, entertainment and shopping, where not only is there a wide variety of all American comfort food and beers, there are also 108 TV monitors linked to 25 satellite feeds. And of course what would a boardwalk be without a sprinkling of kiosks featuring guilty pleasures such as funnel cakes, corndogs and margaritas! Perhaps the walk along the pier might trigger your sweet tooth. No worries, as the Boardwalk Bakery has just expanded with an array of delicious baked goods to choose from. And just down the promenade is Seashore Sweets where amongst many candies, you can find the traditional salt water taffy which you can enjoy while checking out the display of Miss America pageant memorabilia, both of which helped make Atlantic City famous. Besides the various food offerings, the BoardWalk offers entertainment too. In the evenings, you can find street performers dazzling a gathered crowd with their magic and balancing acts. There is a small but fun section of midway games where you can test your skills in an attempt to win a prize. 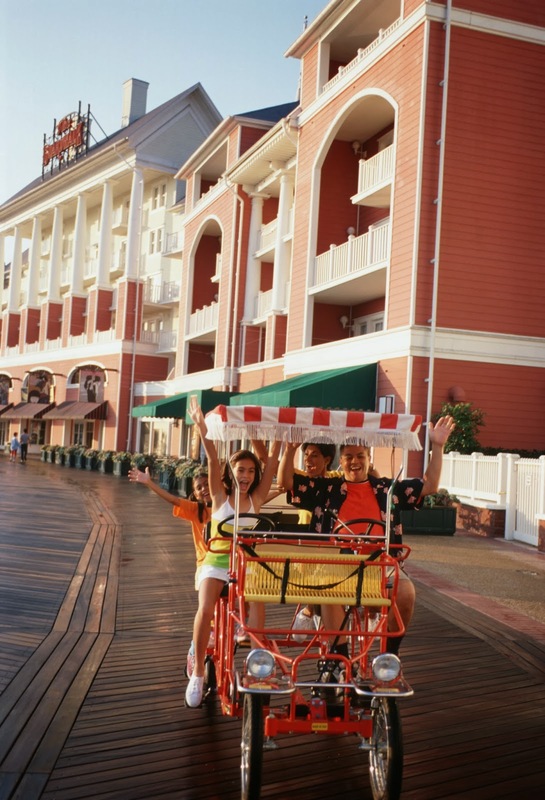 For a fee, the whole family can also pile onto a surrey bike for two laps around the BoardWalk. But be forewarned, while most of the BoardWalk looks flat, there are two hills you’ll encounter and you may want to think about your pedal power versus weight ratio!! For adults, there are two entertainment options. The first is Jellyrolls, a sing-a-long dueling piano bar that is great fun. The audience shouts out song requests and good luck stumping the two extremely talented and knowledgeable players. Please note you must be 21 to enter and there is usually a cover charge. At the end of the entertainment promenade is Atlantic City Dance Hall, another 21 and over venue where you can dance the night away to DJ’d music. Typically there is no cover charge here. On the BoardWalk, you will find other distractions to while away the time such as shopping for a Disney souvenir at Thimbles and Threads or check out Wyland Galleries, a great place to browse nature inspired paintings and grand dolphin sculptures. There are stations for caricatures and hair wraps. And if you are up for a walk around the entire boardwalk that encircles Crescent Lake, you can check out any of the five resorts which all have restaurants, lounges and gift shops to explore. And when the time comes to head back to your resort, you can either use Disney bus transportation or you can request a taxi from in front of any of the resorts. So when you are looking for some night time entertainment and you’d like an option other than Downtown Disney, try the beautiful and fun BoardWalk promenade. And you’ll see why it’s one of my favorite places on Disney property. WISHES - TRULY A NIGHTTIME SPECTACULAR! Disney and Fireworks – Two iconic images that simply go together. It’s also one of those experiences that when you have become a seasoned Disney traveler, it becomes easy to say “Seen that.” In our attempt to beat the system we tend to try to avoid the mass exodus out of the park or avoid standing amongst crowds by watching it from afar such as from California Grill or the beaches of Disney’s Polynesian. Watching Wishes away from Main Street definitely has its place. It can add more magic to a wonderful meal; it can offer an opportunity for kids who are not so wild about fireworks to enjoy without the scary booms; and it can provide a wonderful backdrop for a romantic swing on a hammock for two. But no matter how much you try to rationalize how your feet are killing you and you just want to get back to your resort, there is no denying that watching Wishes amongst the throngs of people, smack dab in front of the castle is an incredibly magical moment whether you’re a first timer or hundred timer. On our recent trip, it took a little convincing… okay a lot of persuading, to coax my tired, complaining, “I just want to go to bed” mumbling family to push through the 15 more minutes they’d have to wait for the start of the show. A quick promise of ice cream to help with the after crowd maneuvers thankfully worked. I was happy to see my brood of teenagers as engaged as I was during the pre-fireworks show, Celebrate the Magic. This seasonally evolving display where the castle is used as a canvas to project some of Disney’s beloved characters as well as some of the best love-to-hate villains even got them shouting out names as they appeared upon the walls. A ten minute lapse between the end of Celebrate the Magic and the start of Wishes meant some of the crowd decided to disperse making it easier for us to find a little more personal space. Thankfully the complaining was minimal during the wait. I guess they figured there was no budging Mom at this point! And then it began with the dimming of the lights, a few get-your-attention rockets, the voice of Jiminy Cricket, Tinker Bell flying out from the castle as the swell of a wonderful musical score filled the air. Suddenly, the iconic moment of being with your family in front of Cinderella’s Castle watching a dazzling display in the night sky had arrived and we were actually living the dream. We were that commercial I’ve seen a hundred times on TV! And when it was over, I almost could’ve hugged the stranger I’d been bumping into the past 20 minutes because we’d both know we’d just witnessed Disney Magic together. So much magic that my kids didn’t even realize the ice cream kiosks had closed for the night. And walking down Main Street to exit the park didn’t seem so horrible when you’re with a couple hundred people who are also still buzzing from what they just saw. The shared experience of a magical, albeit exhausting day in the Disney bubble with family and friends breeds a sort of unusual sense of community. And the long ride back to our resort didn’t seem so bad. It's been a little while since we've been back and re-entry is never easy!! Thank you to all who followed our journey through Facebook. I'm glad you enjoyed it and hope it helped you to re-live some of your own magical moments or to imagine the ones yet to come! As promised, here is a report of some of our gastronomic adventures while visiting Walt Disney World. THE CHALLENGE: DISCOVER NEVER BEFORE TASTED SNACK ITEMS FROM THE FOUR MAJOR THEME PARKS. Chocolate Dipped Elephant Ear – (AFRICA) Is it an ear or a Mickey head? Not sure but doesn’t matter, it’s still yummy! My daughter in particular LOVED this while her brothers thought it was just good. Apple Blossom – (DINOLAND) Super Delish!! All the best parts of grandma’s apple pie and big enough to share! Frozen Lemonade - (ASIA) Okay, so maybe frozen lemonade isn’t too exotic but when you factor in a very hot and sticky day in the Asian jungle and a very cool little shrine just beyond the kiosk that provides a quiet, private retreat with a great view to enjoy said frozen lemonade… well, I considered this a magical moment!! Fried Wonton Dessert in Yak & Yeti – (ASIA) OMG!!! This doesn’t really count as a snack food since it is from the dessert menu of a table service restaurant but there is no way I could not mention this dessert that was featured on the Food Network! Skewers of fresh pineapple and cream cheese wontons, vanilla ice cream and honey vanilla drizzle just does not do this incredible dessert justice!! It’s the sort of thing that haunts me in the middle of the night! Red Velvet Whoopie Pie – (THE LAND) If you are a fan of either Red Velvet Cake or Whoopie Pies, than you are sure to enjoy this sweet treat! Perhaps it was the mini-chocolate chips all along the edges or the very adorable and edible Mickey Face smiling at me while I took my first bite but I really enjoyed this. Chinese BBQ Pork Buns and Curry Chicken Pockets – (CHINA) Less you think we only snack on sugary treats, here are two delicious menu choices from China’s Joy of Tea Stand that at least two of my kids went bonkers over. I often encourage guests to take a day while visiting Epcot and instead of a formal meal, eat your way around the World Showcase. This should definitely be one of your stops! Each item comes as a pair making it perfect for sharing! Kaki Gori – (JAPAN) – I can hear your comments now, “But Debbie, that’s just a snow-cone in a cup!” And a French croissant is just a piece of bread. No need to comment further except to say, go for the rainbow to experience three flavors!! The next two selections are so much more than a single item as it really is about the experience. I simply wouldn’t know how to single out just one treat! Les Halles Boulangerie & Patisserie – (FRANCE) Walking into this relatively new shop in the back of the French Pavilion, I was transported to my trip to Paris. I couldn’t make a decision on just one there either!! Karamell-Kuche – (GERMANY) I never really gave much thought as to all the wonderful things you can do with caramel, but thankfully the good people at Werther’s Original Caramel can!! Giant Cinnamon Roll – (GASTON’S TAVERN) These legendary rolls have been discussed online and quite frankly, my mouth had been watering to try one since I spotted them back in January. Unfortunately, they are a lot like Gaston himself, incredible to look at, but full of air and actually rather dull and boring to the taste buds. A big disappointment but we absolutely loved this tavern so much, we almost didn’t care… almost. At the conclusion of this little report, I would like to note for honorable mention that a closer look inside the Big Top Souvenirs will reveal an area of fabulous treats with a circus theme. The candy apples alone are works of art. And this is what I love most about Disney, that no matter how much you cram into your week… or your mouth, there is always something new to come back and sample!! If this is your first time to my site, I hope you will find lots of great information! 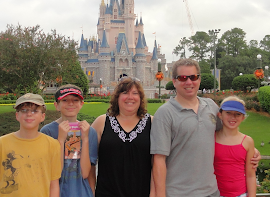 I love helping families plan the perfect Disney vacation so let’s work together to get the magic started! If you've been to my site before, well then, you're family!! I hope you stop by often to see what's new or to get a little Disney fix! We all need that every now and again! Although if you're like me, a daily dose of pixie dust is a must! FINAL DAY 10 OF DEBBIE'S VIRTUAL VACATION! Old Fashion Fun at Tom Sawyer's Island in MK! LET THE MAGIC COME TO YOU! !